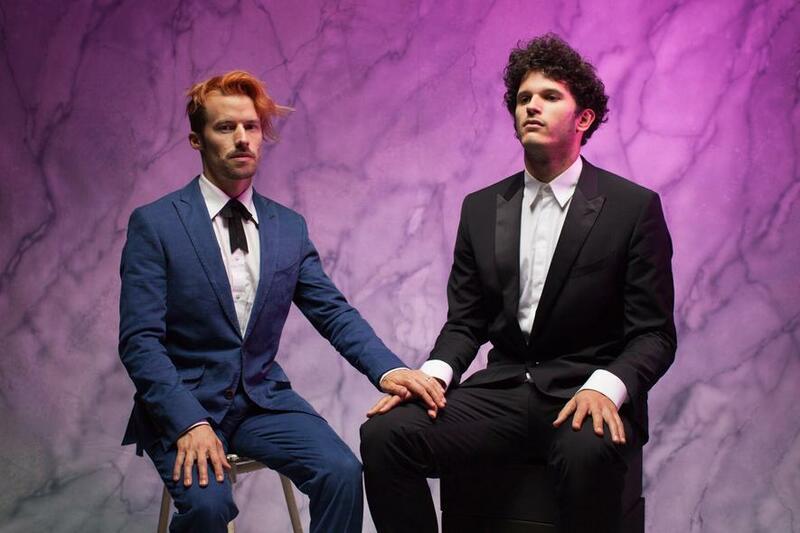 Modern day electropop combining the song-writing talent of Bonaparte and the bona fide beats of Kid Simius. The modern-day European supergroup that is Mule & Man combines the talents of Tobias Jundt, the theatrical Swiss singer-songwriter known as Bonaparte, and Spanish beat maker Kid Simius. Creating ample festival fodder and hook-laden beat symphonies, the duo has crafted a captivating and experimental sound. built upon their individual musical identities. Jundt’s work as Bonaparte plays on his excessive swagger and pantomime theatricals that have won him and his act a cult live following. Meanwhile, Jose Antoio Garcia Soler aka Kid Simius, currently residing in Germany, became affiliated with the hip-hop community thanks to his dexterity with beats and melodies. His solo releases showcase a melodic and gifted approach to broader narratives within his multi-instrumental productions. It’s this sense of jest and performance that harnesses the two producers’ gift for music making. Mule & Man are modern-day Pet Shop Boys, filled with ironic sombre, mirth, clever song writing and beat-driven synth melodies. Their debut EP, One Hand Clap, released in 2016, is a testament to the relationship the two musicians have crafted; a sound that very much belongs to Germany, embodying its contemporary rock sound, with an electronic aesthetic akin to the streets of Berlin. It’s a band you can already picture playing at Melt! Festival or having their music featured during a Modeselektor set. Together they are much more than a mule or a man – they are a deft, modern act with a stunning live presence and big future ahead of them.